Meg has always, always, always had her own style. She isn’t one to succumb to trends (and yes, even in 1st grade, there are trends!) and her bright spirit and personality shines through in her clothing choices… more than any other kiddo we have at home. She knows what she likes and she goes for it… pattern mixing and styling be damned. There was a time, a couple of years ago, when Meg would only wear boy clothes. Batman shirts. Black cozy pants. Brown Converse. (Which all live in Everett’s closest now!) But, slowly, as her closest filled up with hand-me-down dresses from Janie’s wardrobe, Meg began to dress “like a girl” again and she’s taken the role quite seriously since. There’s always pink. There’s always pattern. There’s often an animal print somewhere. The girl has style… there’s no doubt about it. To be honest, I don’t buy her many clothes, if any. The hand-me-downs from Janie usually fill her closet to the brim and, at any given time, she has more clothes than any of the other kids. But, for back-to-school, she picked out a few new outfits to freshen things up. I think that this is my favorite dress in from her back-to-school picks. It’s lightly floral, with a sweet little tie around the tummy. It feels so old fashioned and classic, but when paired with navy cotton tights with silver stripes and her UGG booties, it’s so very Meg. What did your kids pick for back-to-school? 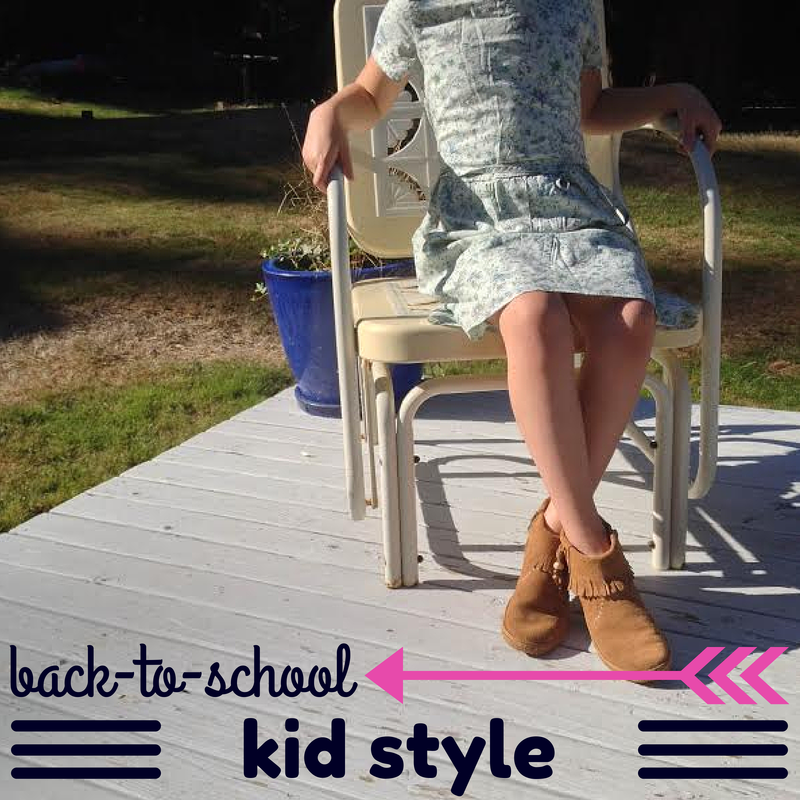 This entry was posted in Fashion & Style, Kid Style and tagged 2014, Back-to-School, GAP, Kid Style, OnlineShoes.com on September 5, 2014 by Katie Kavulla. I’m obsessed with finding those shoes now for my daughter! Adorable.